If there are two apps it seems every geek jetting into Austin, Texas for SXSWi this week will have on their phone, it’s proximity-based networking apps Highlight and Glancee. When Robert Scoble profiled them both for us recently, he singled out Highlight as his favourite. Now, just in time for the networking to begin, it’s received a big update. 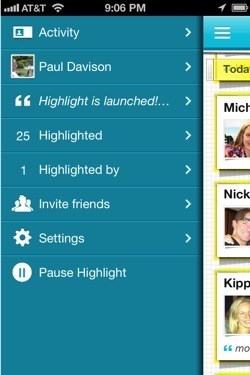 If it’s passed you by until now, Highlight is like a social radar in your pocket. Log in with your Facebook account and the iPhone-only (for now) app will stay running in the background, alerting you when someone who may be of interest to you who is also using the app has come into proximity. For example, thanks to Highlight, I know that while walking through central London the other day, I passed a mobile developer from broadcaster BSkyB who likes Angry Birds – someone who may be interesting for me to talk to. For a festival like SXSW, it could well prove to be a highly useful networking tool. So, what’s new in today’s update? Firstly, Highlight’s timeline provides a bit more detail by not just telling you who you’ve crossed paths with recently, but in real-time. The timestamp above the map will say “now” if someone is still around, making it easier to make those serendipitous introductions. Contact management has received an upgrade too. A search box has been added, allowing you to quickly find details of anyone you’ve crossed paths with in the past, even if they’re not currently in your timeline. 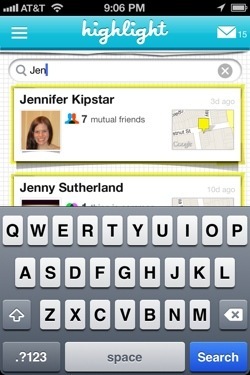 You can now ‘highlight’ contacts for easy reference later. It’s similar to a bookmark on a Web browser, except that your highlights are public – this could act as an interesting, lightweight way of sharing people you recommend as worthwhile talking to. 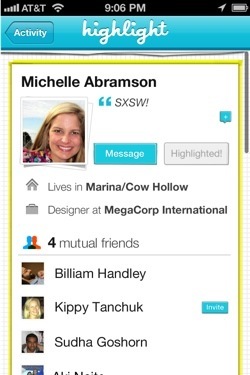 On a similar tip, you can now add people as a Facebook friend or follow them on Twitter, straight from their profile. Finally, a new left-hand navigation pane has been added for accessing all areas of the app, and offering a quick way to pause the service, for those times when you just don’t want to be found. 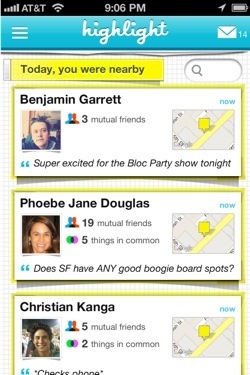 Success at SXSW – assuming pundits’ predictions are right – doesn’t necessarily mean that these apps will take off in the wider market, of course, but there’s no doubt that the potential with apps like Highlight and rival Glancee to overhaul and streamline the process of meeting and keeping in touch with new people is huge. There’s another school of thought that says apps like Highlight are unnecessary, battery-draining, creepy solutions to a problem that doesn’t need solving. Not least our own Drew Olanoff, who was hating on apps like Highlight before it was even trendy to like them. That said, if, like me, you like meeting new people and regularly visit places with a high density of early-adopting geeks, Highlight is well worth getting into.